I've had this recipe and the photo that goes along with it ready to go for a few days now... But I wasn't sure if I wanted to post it. Why? If you look closely at the top right corner of the image, you might notice a hard-boiled egg. I've stated in KLB's About section that I myself am not vegan but choose to follow a primarily vegan diet. While I will never eat meat or dairy products, I do on occasion eat eggs and cook meat and other animal products for non-vegetarian friends and family. My choice to add a hard-boiled egg to my ramen the day I made it was because I wasn't making it for just myself, and I was also craving one! The day I shot the photo above, we debated about whether or not to leave the egg in the shot. The initial reaction was, "Take it out, that's not vegan!" In the end I chose to leave it in. My goal with KLB is to encourage everyone to give vegetarian and pure vegetarian (vegan) dishes a try, even if only for one or two meals a week. If you are strictly pure vegetarian, please eliminate the egg! But for those omnivores and vegetarians who are not yet fully pure veg but may be interested in wading into it slowly, adding a hard-boiled egg to this Miso Ramen might make it the the perfect meal for where you're at right now— just eliminate the egg when you feel ready to take the full pure veg plunge. A side note: I purchased the eggs I used in this meal from my local greenmarket. I'll try not to get all Portlandia on you, but I know that they're local — they came from a farm upstate where the chickens are free-range and very well cared-for. Another side note: I've used dashi miso paste in my broth. This is a pre-packaged miso with dashi added to it, and you can find it in Japanese markets. Dashi contains bonito extract (from fish), so if you are a strict vegan please substitute red miso paste. I've used veggies that I happened to have on hand in my refrigerator in this recipe. Spinach and shiitake mushrooms would also be wonderful choices instead of the carrots, radish and cabbage if you prefer. Prepare the broth: Combine the miso, shoyu, sugar, vegetable stock, and Earth Balance in a large saucepan over medium heat. Warm, stirring occasionally until the miso and Earth Balance have completely dissolved. In the meantime: Cook the noodles according to the package directions (about 4 minutes in boiling water). Drain and rinse very well. Divide between 3 or 4 serving bowls. Stir-fry the veggies: Put the peanut oil in a wok over high heat. Add the ginger and shallots and cook for only a few seconds to flavor the oil, then remove from the wok. Add the carrot and daikon radish and stir-fry for 1 - 2 minutes, until the vegetables are just crisp and glistening with oil. Remove from heat and stir in sesame oil. 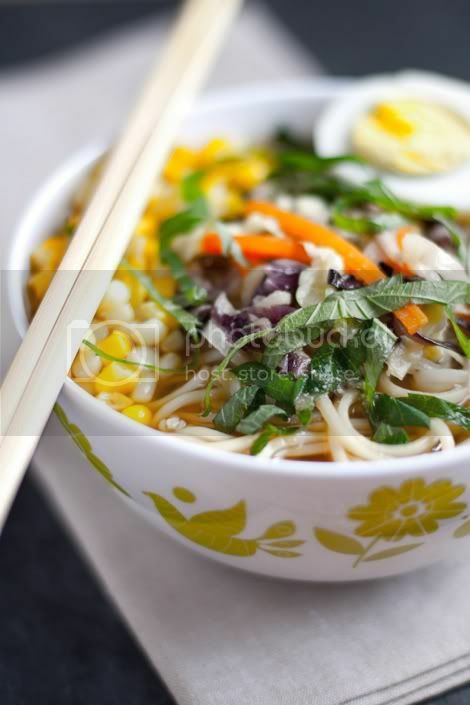 Ladle the warm broth over the noodles in bowls and top with the stir-fried vegetables. Spoon in corn, a hard-boiled egg cut in half lengthwise, or any other add-ins you prefer. 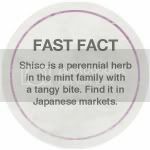 Garnish with chiffonade shiso leaves and serve immediately. Thank you for the recipe! I made it tonight for dinner and it was absolutely delicious. I pickled the ginger, carrot, and daikon instead of stir frying them and added bamboo shoots. Yum! !